Whether shredding the local trails with friends, winning the district criterium, attempting your 3rd Ironman (TM), or a casual commuter, we want you to be happy with how you feel and perform on your bike. We're satisfied when every rider achieves their desired riding experience. With this in mind, we’re proud to be a Body Geometry Fit studio, the best way to make sure your bicycle fits your body. Body Geometry Fit is ergonomically designed and scientifically tested to maximize power, endurance and comfort through a systematic customization of your bike and equipment at all three contact points. 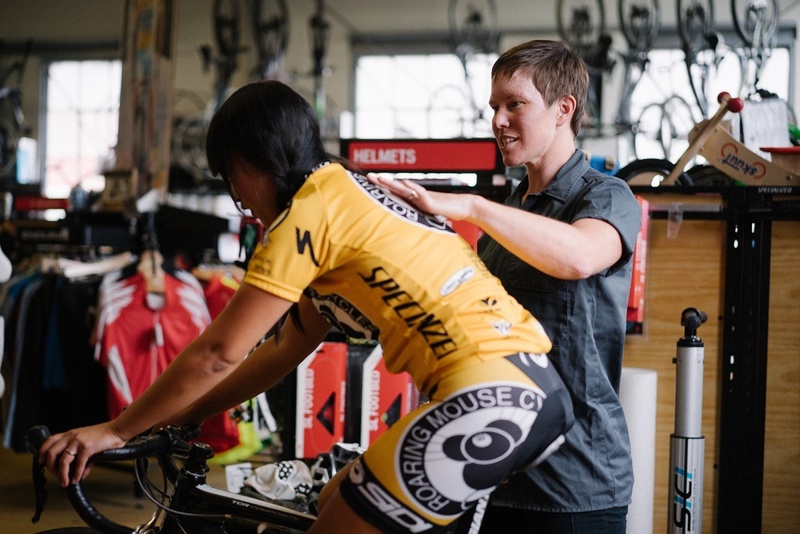 Bike fitting is very personal, and isn't "one size fits all." As such, we'll interview with you to understand any past injuries, talk about current discomfort and discuss your goals for the fit. We'll evaluate and document your total body flexibility and asymmetry, particularly relating to your feet, knees, hips and pelvis, spine, neck, shoulders, elbows and wrists to gain the most accurate information about you. Unique to Body Geometry, we'll asses you from the front view to ensure proper bio-mechanical support and alignment of the foot, hip and knee, delivering the most comfortable and powerful position. Marissa is passionate about cycling, fitness and seeing a client's smile at the end of a bike fit appointment. She believes the world will be a better place with more people on more bikes, enjoying the ride. Fun Facts: Marissa is a two-time Ironman, a member of her collegiate sports Hall of Fame (swim team), and several national podiums in US Masters Cycling. She also makes a tasty margarita. Follow her on Instagram or Twitter and Strava. With 17 years of bike fit experience, Lorri is one of the most experienced fitters in California. She opened her own studio in 2001 and has also fit at various bike shops on the San Francisco peninsula and in Silicon Valley. She trained at the Olympic Training Center in Colorado Springs with USA Cycling, as well as Serotta International Cycling Institute (SICI) in New York and Specialized SBCU Body Geometry F.I.T. and R.E.T.U.L. In Morgan Hill, CA. As an athlete, Lorri has raced road, mountain, track, cyclocross, Paralympic track tandem, and duathlon. She’s participated in countless endurance and ultra-endurance events, including AIDS/Lifecycle, Furnace Creek 508, HooDoo 500, and Silver State 508. She founded Velo Girls in 2002 and is Head Coach for Savvy Bike, coaching skills clinics to hundreds of individuals each year.